Posh right-back Michael Smith delivered an outstanding second-half display against Doncaster. Photo: Joe Dent. 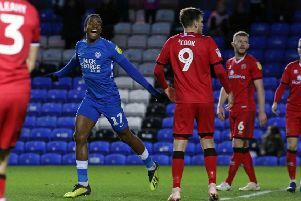 There were many much-improved performances from Peterborough United players in the 0-0 home League One draw with Doncaster today (December 28) according to Alan Swann of the Peterborough Telegraph. Conor Washington: (for Maddison, 77 mins) Hardly seen in possession.